Documentary filmmaker Richard Wolf deserves points for courage as well as artistic achievement. For his latest effort, the director of Behind the Veil ventured on his own into Northern Iraq, without any affiliation or security, to investigate the conditions at the Syrian refugee camp Kawergosk, home to some 12,000 of those displaced by the ongoing civil strife and dangerously close to ISL-controlled territory. The result of his efforts is the heartbreaking documentary A Requiem form Syrian Refugees, which allows many of the camp's hopefully temporary inhabitants to lay bare their hopes and frustrations. The film is currently receiving its premiere theatrical engagement at NYC's Quad Cinema. Utilizing several of the camp's younger residents as a de facto film crew and using the camp's falafel restaurant as his production office, Wolf elicited interviews with residents young and old, hopeful and despairing, resigned and angry, who deliver such messages to the camera as "Indifference kills." Many of them formerly members of the middle-class, they're now forced to live five to ten in tents, relying on UNICEF supplies for food while coping with the inevitable bureaucracy and corruption endemic to such chaotic enterprises. Their misery is palpable--from the mother of eight children who says that she's not capable of taking care of them herself since her husband is working in Kurdistan to the teenage girl who despairs at not being able to continue her education to the parents of a severely disabled young boy. A haunting reminder of their former lives is provided in the form of home movies communally watched on cell phones. Intertitles provide an array of daunting statistics, and the proceedings are scored to the sorrowful strains of Gabriel Faure's "Requiem in D-Minor." Despite the bleakness on display, the film nonetheless has a gorgeous visual quality, thanks to the stark black-and-white cinematography that recalls the Depression-era photographs of Dorothea Lange. And it concludes on a positive note, with dozens of the refugees participating in a celebratory dance that indicates that their spirits are not entirely diminished. In soft black and white, rows of plastic tents spread abstracted and beautiful over the desert. But as the lens widens and the vista shrinks, viewers sit face to face with a four-year-old boy, bed-ridden and immobile from atrophy; with his mother, despairing of a clean environment to care for him; with a teenage girl lamenting the loss of her studies. In the documentary A Requiem for Syrian Refugees, director Richard Wolf gives his subjects, Syrians living in a refugee camp in northern Iraq, a plat-form to tell their truths. The result is urgent, deeply painful yet lovely in its aesthetics. 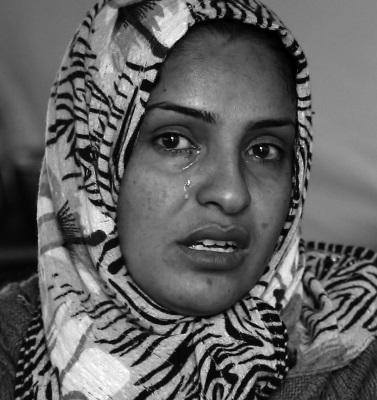 The refugees rarely display their sorrow openly. Instead, in interviews, they discuss practical matters, like improved sanitation, or political anger: "My message to those who have power is: Stop making fun of us." But when a wedding interrupts the camp's tedium, the blank expressions of the celebratory dancers suggest that they cannot forget their reality long enough for joy. Periodically, Wolf inserts a flat black screen bearing text, factual and emotional: "Watching on television fruitless negotiations about the civil war makes the refugees feel powerless..." This tactic might seem heavy-handed, but its cumulative effect is brutal. Requiem is an argument for humanity, as unsubtle as its title. Civil war, de-struction, and dislocation are not subtle experiences. The weight lifts only briefly, when a man plays a video of his village on his phone, and when a girl finds a camera and begins documenting life in the camp. Images are escape, and the respite they provide underscores the resonance of unspoken pain. It's hard to look away, and important to keep watching. A young woman dabs at her tears with the ends of her head scarf and says to the camera, “Help Syria.” A white-bearded man, asked what he’d like to tell the outside world, offers, “Are you deaf?” The solemn father of a paralyzed boy and a girl with Down syndrome semi shrugs and says: “This is my fate. It is from God.” Richard Wolf’s documentary “A Requiem for Syrian Refugees” is as powerfully direct as it is unfortunately heavy-handed, with lingering black-and-white close-ups of barbed wire and children’s wide eyes. But the film is eloquent, too, thanks to the voices of the refugees themselves. The subtitles are sometimes stilted, too faithful to word-for-word translations, but we get a palpable sense of what life is like in one camp in northern Iraq. About half the children there attend a Unicef school. One family opens its food-program box and unpacks plastic bags of pasta. In a refugee-owned nail salon and boutique, elaborate evening dresses hang incongruously on tent walls. And as in any “city” of 12,000 people, politics has taken hold. “People give jobs to their friends and relatives,” one woman with a resigned expression reports. To remind us that these are people who had quotidian lives, one refugee holds up his smartphone and shows a video of people playing in the snow in his hometown. One man recalls watching news broadcasts about the Arab Spring. “Suddenly it started in Syria,” he says. “We saw a demonstration on TV.” And here he is. Richard Wolf is an award-winning filmmaker (Behind the Veil, Women of The Sand) who has directed more than 30 documentaries and boasts an international reputation for marrying social activism and investigative reporting with striking cinematography. This time around he focuses his lens (literal and metaphorical) on KAWERGOSK, a United Nations Camp in Northern Iraq which houses 12,000 Syrian refugees whose lives have been devastated by the brutal and intractable civil wars in their homeland. One refugee recalls being unable to attend his cousin’s funeral— unable to leave his house at all in Syria—because the city streets were awash in snipers shooting at any living creature, including stray cats. A Requiem for Syrian Refugees represents Wolf’s effort to call global attention to the horrors and wake up the powers that be. Shot in black-and-white, the film is visually evocative, from its panoramic views of barren lands covered in thousands of tents, to hundreds of people lined up for their weekly stipends of food and water, to poignant close-ups, most memorably of a child fast asleep in a carton. The misery of the refugees is palpable as they recount their past losses and anticipate futures devoid of prospects. Their immediate living conditions render them almost speechless. The parents of a severely disabled youngster admit they spend much of the day simply trying to keep him clean. There are virtually no medical supplies or personnel. A mother of eight says she no longer has the strength to care for her children, while her husband who works in Kurdistan surfaces only on weekends. Another refugee says had he had known it would be this wretched, he would have stayed in Syria and taken his chances there. Yet life goes on and Wolf captures those moments of resilience. A makeshift classroom is set up in a tent and children attend a school of sorts; in another, tent refugees gather to play traditional instruments and sing folk tunes. Even a few businesses have cropped up, including a barbershop and food truck. A sense of joy prevails as a festive traditional wedding is celebrated. The dancing in the rubble is perhaps one of the most striking scenes in the film. So too is the use of technology in this primitive landscape, as refugees convene to view old family photos and home movies on cellphones. Still, corruption is rampant. Money paid under the table for services is not uncommon. The refugees’ interpretations of what has happened to them reflect an array of worldviews. Some Syrians are religious and fatalistic. They believe their circumstances were meant to be and they have to live with it. Others are enraged at the universe and threaten payback. Now we’re the pawns of the powerful, one young man notes, but in the future our roles will be reversed, he warns. Still others try to express a degree of hope. A college-age woman, who gave up her dreams of an education, likes to believe she will be able to return to school. Even a mother with many children concedes she’d love to attend a university too. Whether the film will help generate action is arguable, though Wolf has done a fine job in painting a disturbing portrait of refugee life with no end in sight. His achievement is all the more impressive in that he entered a dangerously volatile territory without special security or affiliation. Nonetheless, he was able to develop close relationships with a number of refugees who came on board as crew members and served as liaisons to those who were open to speaking about their experiences on camera. Still, a little more political background might have been useful in placing the refugee crisis in a larger context. The film might also have profited with some cuts early on as the refugees recount atrocity after atrocity. Viewers have learned to tune out. The other miscalculation was utilizing Gabriel Fauré’s Requiem in D-Minor to underscore the pervasive despair. The refugees’ lives speak for themselves. The intensely dramatic music adds nothing. It’s simply intrusive and distracting. !